The world suffers from an identity crisis and it leaves many of us royals behaving below our rank. Whether we’ve grown up reading fairy tales or find ourselves idolizing leaders, athletes or celebrities today, the notion of royalty captures our individual and collective imagination. Somehow, we equate royalty with a few coveted spots. We believe those exceedingly few positions belong to someone other than our friends, family, co-workers and even ourselves. We envision crowns as the birthright of a rarefied few: the monarch, the corporate titan, the Hollywood diva or the latest athletic phenom. These are the ones who dominate headlines, capture an inordinate amount of attention and overshadow others in their realm. I’ve never reserved the notion of crowns for the half dozen personages that society chooses to recognize. Instead, I’ve seen glory in all — even those unable to see it in themselves. It is easy to acknowledge statistics of certain athletes, the box office numbers of movie stars and the mega-profits of global CEO’s. But it takes a certain eye to ascertain the hidden glory, the less touted gems that others carry within their frame. The common world may miss their majesty, but my inner vision catches glimpses of hidden, underdeveloped or less flashy regal treasures. And it makes me smile. A few years ago, I was inspired to write a blog on the subject of glory while visiting the Archaeological Museum in Thessaloniki, Greece. With several ancient crowns on display, I captured my smiling image posing beneath one of the historic wreathes. The blog, available by clicking here, was titled You Don’t Need to be King to Wear a Crown. The idea that glory belongs only to a few causes many to go awry. The belief in scarcity causes lots of unnecessary — and often unbecoming — behaviors. In their quest for supposed superiority, some feel the need to take advantage of others — and do. Others, believing glory has eluded them, fall easy prey to wannabe oppressors. Recently, I was reminded of an old expression that references the kinds of wannabe kings we encounter in our everyday lives. 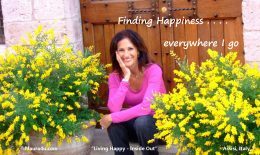 The simplicity of the adage caused me to laugh, reflect and produce the following podcast. Whether you’ve been grabbing a crown by taking over someone else’s territory or playing unwitting doormat to another person’s out-of-bounds crown, there’s a bit of humor and healthy realignment waiting for you. Remember the remark,”Who died and made you king?” Click here or on the podcast image below to hear more about it. 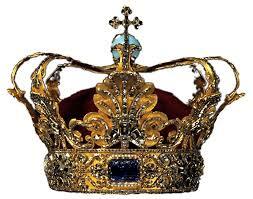 After you listen, be sure to read up on my blog about crowns. You’ll be inspired to claim the crown that belongs to you and you alone. The road to royalty is already yours. Actress and movie queen Julie Andrews understood the true meaning of royalty. It’s not necessarily about outward opulence or hoopla, but about who you re inside. May you discover your personal glory by remembering your finer gifts, your rarefied character and your very best traits! I truly enjoyed this Maura – thank you!